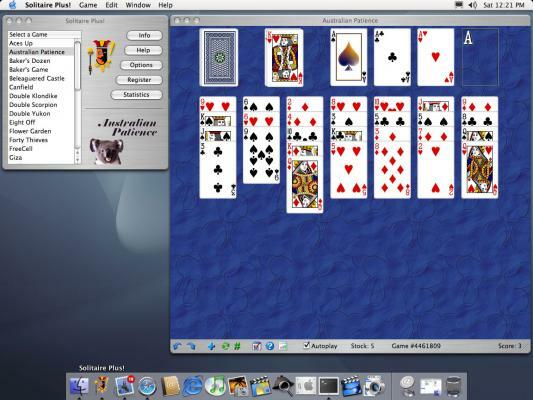 Solitaire Plus for MacOS X is now available as a Universal Binary and supports all Macs running OS X 10.1 or later! Is your current PowerPC Mac running fine using Jaguar or Panther? This game does not require an upgrade of your PowerPC's OS X version to play. Of course our game works great on Tigier too! Solitaire Plus is a fully-featured Mac solitaire game collection designed for MacOS X. Enjoy a generous collection of 30 challenging solitaire games on your Mac mini, iMac, Power Mac, iBook, PowerBook, Mac Pro, and all MacBooks. In short, Solitaire Plus works on all Apple hardware that runs Mac OSX. Solitaire Plus! for MacOS X currently offers 30 fun and challenging solitaire variations: Aces Up, Australian Patience, Baker's Dozen, Baker's Game, Beleaguered Castle, Canfield, Double Klondike solitaire, Double Scorpion, Double Yukon, Eight Off, Flower Garden, Forty Thieves, Giza, Golf Solitaire, FreeCell, Indian Patience, Klondike (Windows solitaire), La Belle Lucie, Montana (Gaps), Nestor, Pyramid solitaire card game, Pyramid Golf, Queen of Italy (Terrace), Russian Solitaire, Scorpion, Scorpion II, Sea Towers, Simple Simon, Spider Solitaire and Yukon.